Paul Julius Baron von Reuter (July 21, 1816 - February 25, 1899) was a German-born British entrepreneur and media owner, the founder of Reuters news agency. Born into a Jewish family as Israel Beer Josaphat, he changed his name when he moved to England and converted to Christianity, being baptized Paul Julius Reuter. For his achievements he received the rank of baron, after which he became known as Paul Julius von Reuter or Paul Julius de Reuter. Innovative and insightful regarding the developing field of communication and the mass media, Reuter worked hard to develop his company. Early on he recognized the need to bring the news as quickly as possible to the public, using carrier pigeons to bridge a gap in telegraph lines, and making use of underwater telegraph lines as soon as they were installed. An innovator in the field, he still recognized the need to cooperate with the other European agencies, coming to agreements with the French Agence Havas founded by Charles-Louis Havas and later known as Agence France-Presse (AFP) and Bernhard Wolff's Wolffs Telegraphisches Bureau in Germany, to divide the territories fairly. Reuter set a standard for timely and concise news reporting that guided his agency for over a century after his death and influenced news reporting throughout the world. Paul Julius Reuter was born on July 21, 1816, in Kassel, Germany to a Jewish family, his father being a rabbi. They named him Israel Beer Josaphat. The young Josaphat first worked at his uncle's bank in Göttingen. There he met Carl Friedrich Gauss, the mathematician and physicist who conducted pioneering research in electricity and magnetism. At that time, Gauss was experimenting with the transmission of electrical signals via wire, building the first electrical telegraph in 1833. On October 29, 1845, he moved to London, calling himself Joseph Josaphat. He quickly converted to Christianity and on November 16 was baptized Paul Julius Reuter. One week later, on November 23, he married Ida Maria Elizabeth Clementine Magnus. Their children included a son, Herbert, who took over his father's news agency on his retirement but later committed suicide, shooting himself on April 18, 1915. Their daughter, Clementine Maria, married Count Otto Stenbock, and after his death, Sir Herbert Chermside, a British military officer and governor of Queensland, Australia. Reuter returned to Germany, this time to Berlin, where in 1847 he became a partner in a bookstore and publishing company, Reuter & Stargardt. Known for publishing political pamphlets, when the Revolution of 1848 failed, he fled Germany for Paris. There, he tried to establish a news agency but it failed in a few months. He then worked in Charles-Louis Havas' news agency, the future Agence France-Presse. By 1850, Reuter was back in Germany where he founded what became the world-renowned financial news agency bearing his name, Reuters. In 1851, he moved back to London and set up an office near the London Stock Exchange. On March 17, 1857, Reuter was naturalized as a British subject. On September 7, 1871, the Duke of Saxe-Coburg-Gotha conferred on him the rank of baron, after which he became known as Paul Julius von Reuter or Paul Julius de Reuter. Later, he received the same rank in England. Reuter retired from the news agency in 1878, handing control over to his son, Herbert, although he continued to be involved for many years. He moved to Nice, France, preferring the warmer climate, and died at his home, "Villa Reuter." His body was taken back to London and buried in the family vault at West Norwood Cemetery. Following his introduction to telegraphy through his acquaintance with Carl Friedrich Gauss, Reuter embarked on a career in the media. Despite some initial failures, his entrepreneurial spirit led him to success when he founded the news agency that became one of the major such agencies in the world, Reuters. After fleeing from Germany to Paris in 1848, Reuter worked in Charles-Louis Havas' news agency, the future Agence France Presse. In 1850, the 34-year-old Reuter was based in Aachen, Germany, close to the Dutch and Belgian border, and began using the newly opened Berlin–Aachen telegraph line to send news to Berlin. Reuter noticed that with the electric telegraph news no longer required days or weeks to travel long distances. However, there was a 76-mile gap in the line between Aachen and Brussels. Reuter spotted the opportunity to speed the transmission of news between Brussels and Berlin, founding the Reuters News Agency, which transferred messages between Brussels and Aachen using carrier pigeons. The carrier pigeons were much faster than the post train, giving Reuter quicker access to stock news from the Paris stock exchange. In 1851, the carrier pigeons were superseded by a direct telegraph link. In 1851, Reuter moved back to London and set up his "Submarine Telegraph" office in October, anticipating the opening of the underwater telegraph cable under the English Channel the following month. He negotiated a contract with the London Stock Exchange to provide stock prices from the continental exchanges in return for access to the London prices, which he supplied to Paris brokers. From that foundation, Reuter obtained subscriptions from several British newspapers, including The Times. For over a century, Reuters served as the news agency of the British Empire, providing in the most timely fashion "truth in news." In 1861, the British Prime Minister Lord Palmerston presented Reuter at the court of Queen Victoria. 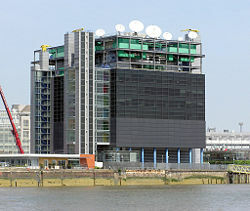 Reuters offices opened all over Europe, following Reuter's motto "Follow the cable." Reuter's agency built a reputation in Europe for being the first to report scoops from abroad, such as the news of Abraham Lincoln’s assassination in 1865. The transatlantic cable opened in 1866, and the continued expansion of undersea cables allowed news to be communicated from around the world even more quickly. Reuter opened offices beyond Europe, starting with Egypt and reaching the Far East and later South America. As global communication developed, Reuter made an agreement with rivals Havas in France and Wolff in Germany, which divided the territories of the world among the three agencies. fires, explosions, floods, inundations, railway accidents, destructive storms, earthquakes, shipwrecks attended with loss of life, accidents to war vessels and to mail steamers, street riots of a grave character, disturbances arising from strikes, duels between, and suicides of persons of note, social or political, and murders of a sensational or atrocious character. It is requested that the bare facts be first telegraphed with the utmost promptitude, and as soon as possible afterwards a descriptive account, proportionate to the gravity of the incident. Care should, of course, be taken to follow the matter up. The Reuters company continued to build on the foundation established by Paul Julius Reuter. It became one of the largest news agencies in the world along with the Associated Press, Agence France-Presse, and United Press International. Reuters has supplied images, video, and text to a large number of news outlets around the world, including newspapers, television stations, radio stations, corporations, and bloggers. Their material is used extensively around the world by both major and minor news outlets through an extensive electronic network, which Reuters pioneered. Reuters has served as a significant force in the development of world communication, both in terms of the physical aspects as pioneered by Reuter's innovative use of developing technology and in the standards of news reporting he established back in 1883. ↑ 1.0 1.1 K. M. Shrivastava, News Agencies: From Pigeon to Internet (New Dawn Press, 2007, ISBN 1932705678). ↑ Paul D. Wilson, Chermside, Sir Herbert Charles (1850-1929), Australian Dictionary of Biography, Volume 7 631-632 (Melbourne: Melbourne University Press, 1979). Retrieved August 26, 2008. ↑ Tom Standage, The Victorian Internet (Walker & Company, 2007, ISBN 0802716040). ↑ Donald Read, The Power of News: The History of Reuters 1849-1989 (Oxford: Oxford University Press, 1992, ISBN 0198217765). ↑ Thomson Reuters, Company History. Retrieved August 26, 2008. ↑ James Harding, Has Reuters chosen the right way ahead? The Times, May 16, 2007. Retrieved September 2, 2008. Read, Donald. The Power of News: The History of Reuters 1849-1989. Oxford: Oxford University Press, 1992. ISBN 0198217765. Read, Donald. Power of News: The History of Reuters. Diane Pub Co, 1999. ISBN 0756762219. Shrivastava, K. M. News Agencies: From Pigeon to Internet. New Dawn Press, 2007. ISBN 1932705678. Standage, Tom. The Victorian Internet: The Remarkable Story of the Telegraph and the Nineteenth Century's On-line Pioneers. Walker & Company, 2007. ISBN 0802716040. 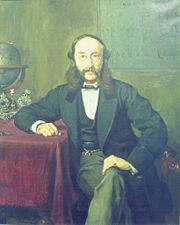 Paul Julius Reuter Encyclopedia of World Biography. Gale Group, 2004. This page was last modified on 30 January 2019, at 17:27.